Video ads have finally come to Pinterest, as the social network Wednesday announced the launch of Promoted Video. Promoted Video ads are video ads with the Pinterest touch, as they also contain featured pins, which are aimed at encouraging users to take action after watching the videos. Pinterest said in an email to SocialTimes that it ran alpha tests of Promoted Video with 12 partners during the second quarter, adding that it teamed up with Millward Brown on a study of the ad units and found that they delivered “significant brand lift metrics” across several verticals and were four times more memorable than ads without videos. 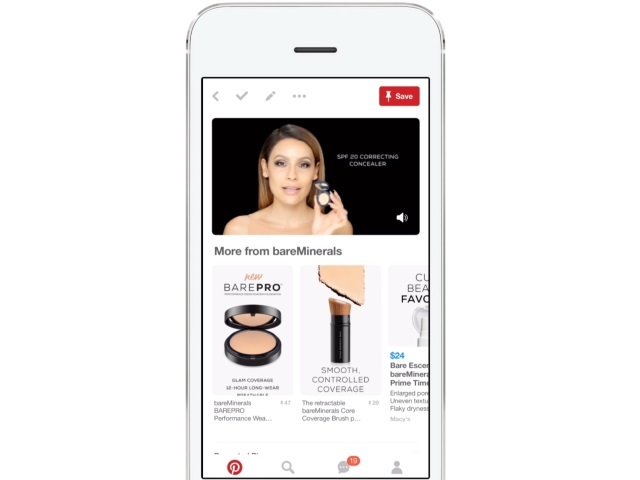 Product manager Mike Bidgoli said in a blog post introducing Promoted Video that Pinterest has seen videos posted to the social network increase 60 percent over the past year, adding that the feature is available to managed partners in the U.S. and U.K., and units can be reserved as premium inventory. The 12 alpha partners included General Mills’ Old El Paso, Universal Pictures (for The Secret Life of Pets) and L’Oreal Paris’ Garnier. PinterestPromotedVideoTheSecretLifeOfPets from SocialTimes on Vimeo. PinterestPromotedVideobareMinerals from SocialTimes on Vimeo. Promoted Video brings together some of the best elements of Pinterest. According to recent data from Mary Meeker, 55 percent of people on Pinterest want to find or shop for products. Only 12 percent of people say that about social networks. And since 75 percent of the content people enjoy on Pinterest comes from businesses, we’re offering something unique and valuable to people and businesses alike. With Promoted Video, businesses can share their ideas with the people who are looking for them and make it easy for them to give these ideas a try. While other platforms primarily offer video views, we’ve coupled Promoted Video with featured pins below the video. Now the 67 percent of people who say videos on Pinterest inspire them to take action can experience your brand and then simply click below to do more with your products and services. Plus, with our new native video player, this all happens in one seamless experience. We’ve run several campaigns with Pinterest and consider video a natural evolution on how we want to connect with our Pinterest audience. Our customers come to Pinterest with high intent, and the ability to show a recipe and our products through video is a unique opportunity to drive higher performance. Readers: What are your initial thoughts on Promoted Video from Pinterest?